Etta confided to her school teacher that Elaine frequently drank alcohol at home and had hit her. Concerned about Etta’s well-being, the school called the police. On March 11, Elaine was arrested by the police when she attempted to pick up Etta at school. For Etta’s well-being, she has temporarily been removed from Elaine’s care. Elaine has not seen her since she was released on bail. “I really didn’t know what happened – I haven’t slept for days. On the day [of the arrest], I went to the school at 4 p.m. to pick Etta up like usual but didn’t see her. When I called her, she said she was talking to her teacher. I waited until 6 pm and she still didn’t come out. Soon afterwards, two police officers and Etta’s teacher told me that Etta had wanted to commit suicide. I looked at my daughter and wondered how this was possible. I talk to my daughter every single night and we always ask each other about our day. We always say things are fine,” said Elaine. Etta felt depressed as she was not socially accepted among her peers at school. Etta did not share her problems with Elaine, whom she felt already had too many burdens. Speaking with the media, Etta revealed that Elaine would drink two bottles of wine every night, and did not stop even after vomiting. Sometimes, Elaine would cry non-stop after she got drunk, which led to physical skirmishes between mother and daughter. One time, Elaine hid in the bathroom after drinking too much. Seeing her mother frequently turn to the bottle, Etta felt helpless. Coupled with her stress at school, Etta suffered from suicidal thoughts. Finally, she confided in a trusted school teacher about the problems at home. Noting there has been a breakdown in communications with Etta, Elaine reflected on her own mistakes as a mother. Elaine admitted that she drank red wine at home to relieve her insomnia. Since Elaine’s release from bail, Etta has not seen her mother and also refused to respond to her phone calls and text messages. However, Etta remained in touch with her godmother. However, Elaine denied physically or mentally abusing Etta. Elaine expressed her shock over allegations of child abuse, “I never thought the matter would blow up to such proportions. At first, I thought my daughter had a tantrum. It’s impossible. As to hitting her, I only did this….” Elaine demonstrated pushing the interviewer’s shoulders lightly. Although bewildered by the turn in events, Elaine said the most important thing now is to help Etta face any problems she is experiencing. Sounds like Elaine Ng is a good single mother under tremendous stress (from work, child rearing, etc.). She just needs to control her alcohol (not child) abuse. Precisely, and removing the child is going to aggravate matters NOT improve it. The teen is under such stress too because of her father and the public scrutiny, not just her mom’s alcoholic issues. Was there really a safety issues? So where is she removed to? Foster homes are sometimes horrendous places. Foster parents often work for onlt money. And authorities don’t scrutinise these strictly, the way they jump at every ‘fault’ of the biological parents once they are deemed unfit. I think you are wrong there. Only by losing what’s precious to us, we would know to work better and fix ourselves. If you leave the child with the abused mother and do nothing, not only you make the child feel isolated, getting no support, you can make the mother abuse the child more as she feels the trust is violated. Only by removing the child, the mother knows her position of power is not as strong as she thinks it is. And that the child knows her current situation is not as helpless as it seems to be. If I have to pick who to save, I would pick the child. And in these cases, if the parents really want to make amend, they will now has all the helps from the social workers. Put it this way, the current system of how to deal with domestic violence is made based on experiences from years of dealing with family violence. This issue was not just started and known by our society from yesterday. So I would trust their practice more than your view, even if the approach is not perfect. It’s like do they want to be sure then act on it, and it’s too late, or jump the gun and actually save lives. Poor kid. I think jackie chan should step in. It is his child after all. Can’t imagine how this girl feel. Dad don’t want to acknowledge her, mom is in the mess. She is at sensitive age. I think Etta didn’t know her confide with teacher will blow out of proportion like this. Hope she can hold on and walk out through this difficult time. Call for her. Really pity her daughter. She had already lost a father she should not lose her mom too. We don’t walk in those same shoes. – who knows what pressures she faces with the whole world knowing she was the 3rd party in the JC marriage? – I don’t condone her part in it, but JC is an adult fully 50% responsible for his actions. – we don’t know how much clout was exerted AGAINST her for making the pregnancy public. as in JC friends. Joan Lin influence. – how hard is it in survive in the same industry and bring up her child, and try find a job just to survive? if I am not mistaken, she has an eldery mom to support too? (Elaine comes from a single parent family herself). We all know what we “should” do ro should be doing … but everyone is human, with failings and different abilities to cope under different situations. Well, does this mean she has the reason to waste herself with alchocol and (perhaps) drugs? She should seek help before things got this worse. You mentioned she’s from a broken family herself and she should know how hard it is/was for herself and this should be her motivation to raise her daughter up normally rather than taking these substance to deal with all these problems. Well everyone has their own opinion, but the bottom line is she is and she should be responsible for her daughter’s upbringing and ultimately her own too. I think the teacher was jumping the gun and should have consulted Elaine separately to get her side of the story. Everything is getting out of proportion now that this is in the media. Discipline does not equal child abuse. Taking the child out of the security and familiarity of the home environment and not see her mother would most likely cause more distress to the child. Etta might be thinking she has done something wrong and cause her mother to be ‘arrested’ and taken in by the police for questioning. Single parenting is tough enough. Doesn’t need other to judge them on everything they do. The teacher may be jumping the gun but she did the right thing. It is not her duty to inquire. Her duty is to report any suspicion of child abuse. It is the authorities to investigate and the welfare to consider whether to remove the child or not. If she never reported and the child died of abuse, who gets blamed? But removing the child and prosecuting the mother is not within her control and that we can question. I think so too – that the interference may be more harmful than helpful. They perhaps could have monitered the family and supported with other helpful resources or services. And what is going to stop Elaine from drinking even more now, with her daughter gone, and this negative public stress on her? Elaine should help herself first. Kick the habit and rebuild relationship with daughter. Her daughter felt suicidal, so problems at home may be more serious than Elaine is saying. I think removing her is a good thing for now. If Elaine doesn’t wake up and be better, I don’t know what will. Any mom even married with an unsupportive partner and the resulting baggage created is tough. Many abuse stories arise fro very tired parenting with no support at all from useless spouses or a lot of home stress. In Elaine’s case, it’s not just single parenting. The outside pressures of everyone knowing her public story and life thereafter … trying to find a job in the same industry (who really knows what power-play clout JC and Joan Lin friends and supporters can wield over her career opportunities? Even when Jaycee Chan is arrested … his other child and the parenting aspect is also often mentioned. That public scrutiny never ends, along with it the unseen built-up stress and pressure. Many factors, on top of trying to be just the single parent in her case. Elaine Ng was only in her mid-20s (still young and innocent) when she was taken advantage of by irresponsible “perrrrvert” dog, Jackie Chan. No offense mw but that is one funny coMment. Sorry, was thinking “naive” (but used “innocent”). Just curious, anyone noticed that she and linda chung look very alike? It’s tough being a single mother but Etta Ng’s teacher did the right thing. Any signs of abuse must be reported. She doesn’t need to “talk to the parent” on the side, because you never know; it might jeopardize the child’s well-being. Agree Linda C resembles like Elaine very much this is how Linda will look when she gets old. Totally agree,Elaine n Linda look like two sisters. Where was the father all this time? She has no father! She named after her mother’s last name dude! If jacky is her real father and he knows it, then he should be responsible for her. He started the problem of bedding the mom and now he says he is not going to admit Etta is his daughter ?? What kind of a man is he. I doubt Elanie abused her daughter. The girl is like 15 years old for crying out loud. If she was a bad mother, the abuse would have started when she was much younger. Elanie may have issues – alcohol, and maybe substance abuse – brought on by the pressures she faced as a single mother. She may have inadvertently hurt her daughter BUT that is not abuse. The media just blew it all up. Come on, if I slapped my teenage daughter because she was rude to me and said things that were out of line, does that warrant social services to remove her from me?! 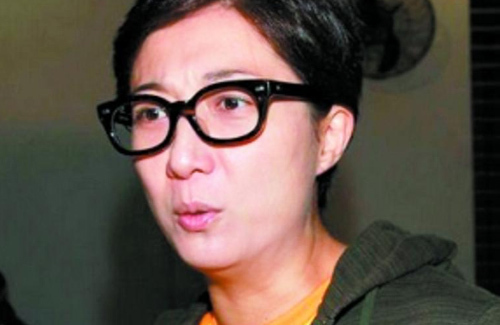 Why blame it “all” on Elaine Ng? Most of the blame goes to Jackie Chan for not taking “responsibility” for his actions (creating a daughter). Any child would want to commit suicide base on that alone (without the media making things worse). Agree. Saw another picture of elaine on another website. She seems like she is going to cry. I think she needs support rather acrimony. i wonder what she does for a living? i remember seeing her in a drama few years ago but haven’t seen her recently. she must be under alot of stress since jackie is not going to care for her or the daughter and she’s a public figure. Being a single mother is hard. Being a single mother in hong kong where all her child parents and classmate probably know that her daughter is JC child in an affair must be even harder. I feel bad for her. I hope she will stop drinking and they can recover from this. Sad news……adult problems affect the wellbeings of the kid. all her mother is all she has. Shame on the man who slept with her mother and did not have the gut to be a responsible father. He should just sleep with his millions of dollars and stop telling people what is right what is wrong. Hopefully people can give Elaine another chance as after all she has the courageous to bear the mistake she made in the past. She could easily choose an easy path (abortion) but she did not. She brings up her kid by herself. Elaine and her daughter……hope times can heal the pain you suffer and be positive towards life. Well said, in a nutshell. Though with globalisation and crossovers, the HK E-indust is also in China these days. Didn’t know her move back to HK was permanent. Always thought they were still in China. Wasn’t Chingmy Yao Suk Cheng the one who donated an old VW for her use when Elaine was trying to set up house? I thought back then how heartwarming she still had gfs who weren’t afraid to incur the wrath of the powerful Albert Yeung (Jackie Chan’s gd friend who spoke out for him) or Jackie Chan/Joan Lin connections. I boycott Jackie Chan by not watching his movies. I don’t have a good impression of this man at all based on the articles I read about him thus far. Regardless of who initiated the affair back then one thing is certain; there is no denying that Etta is his daughter, period. And let’s not whisper the word “illegitimate” daughter because we don’t need to add insult to injury any further. My immediate thought of the above picture of Etta is that she is the spitting image of Jackie Chan. My prayers are with your family, Elaine and Etta. You all will work things out in no time and will get through this together because the two of you stand shoulder to shoulder. I am calling out to you, Jackie Chan. While you still have time undo the damage you’d already done to these two women before it’s too late to turn back the clock. It’s time for you to pay your debt as you are forever indebted to these two. However much you don’t want to admit it, they are part of your life, at least in this life time. Even if they are not in any way connected to you, you should help them; let alone they are connected to you. Open your heart and embrace them into your life. It’s time for you to be a kind person to them and to create a kind world for them to live in. Doesn’t Hong Kong have a law that says a father is financial responsible for his biological child? US does. I don’t buy that JC hasn’t contributed towards Etta’s support. He paid Elaine to deny she accepted money. Hope she will get into rehab for her full recovery. Feel pity for her daughter. For goodness sake, you all act as if she is the only single parent out there raising a teenage kid. There are millions of single women raising children with love and respect. To say that life was tough because she had to work to make a living and raise a child, boo hoo, so are the rest of these women. She knew that life would be hard once she made the decision to continue with the pregnancy. If you make the choice to have a child than step up and do the job that is required. No one knows for sure whether child support is being provided or not, but hell if Elaine is drunk all the time, how would she know or even remember if she was abusive towards her daughter. The issues between mother and daughter is what’s important at this time. Furthermore, it’s common knowledge that Jackie is an absentee parent by choice and that’s for them to hash out, not the media or the netizens. Heck, there are tons of single parents out there treating their children waaaay worse without jail or separation and it doesn’t make it in the news either.